If it’s not enough that developers inkle turned gamebooks on their heads with their wonderfully creative adaptation of Steve Jackson’s Sorcery! ($4.99), they’re now trying to out-adventure Jules Verne in his own story. 80 Days ($4.99), based on the classic Verne novel Around The World In 80 Days, takes the nearly-perfect premise of the book and uses it as a launching point for one of the most interesting tales I’ve come across in the interactive fiction genre. 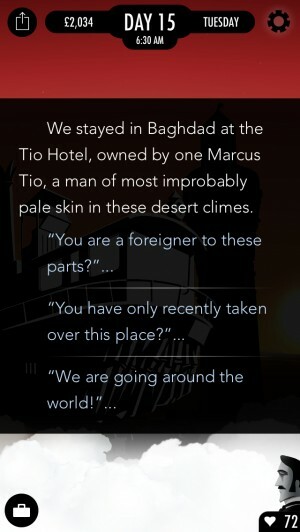 This isn’t the kind of game that is going to get people to cross lines if they don’t like this genre, but if you do, 80 Days is pretty much a must-have thanks to its sharp writing and incredible replay value. On the off chance you’re not familiar with the story in one of its many forms, 80 Days follows the adventures of English gentleman Phileas Fogg and his French valet Passepartout as they try to make good on Fogg’s wager that he can circumnavigate the globe in a mere 80 days. Fogg’s good name and fortune are on the line, and while 80 days seems like a long time, unpredictable events keep popping up to steal away those precious hours. While various other elements from the original story can potentially crop up depending on your choices, there’s a good chance that the premise is the only familiar element you’ll come across in your own adventures. 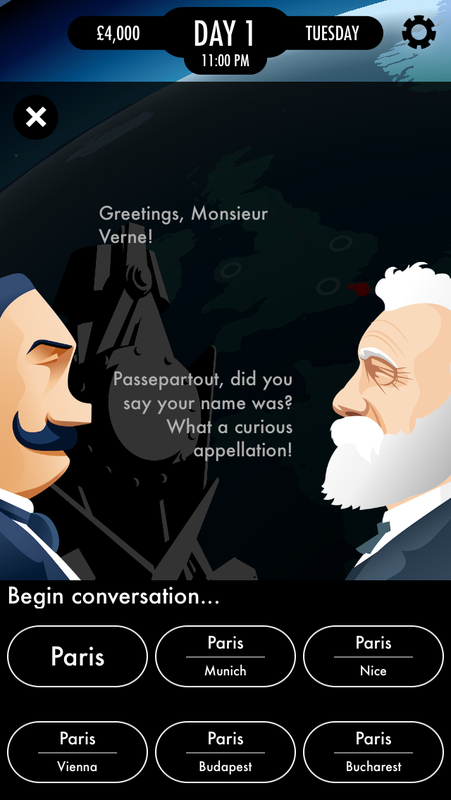 As in many versions of the story, Passepartout takes a much larger role than Phileas in 80 Days, standing in as your playable character. Although you have a great deal of control over some of the finer points, he has a personality all his own that comes through. This is also a very different world from that of the book, filled with all kinds of Verne-inspired science-fiction and fantasy elements. The game basically plays out like a Choose Your Own Adventure, but in a manner and scale that a physical book would be very hard-pressed to imitate. Choices pop up constantly in the text, and while you’re generally choosing Passepartout’s actions, sometimes you’re actually shaping other people or the world itself with your choices. 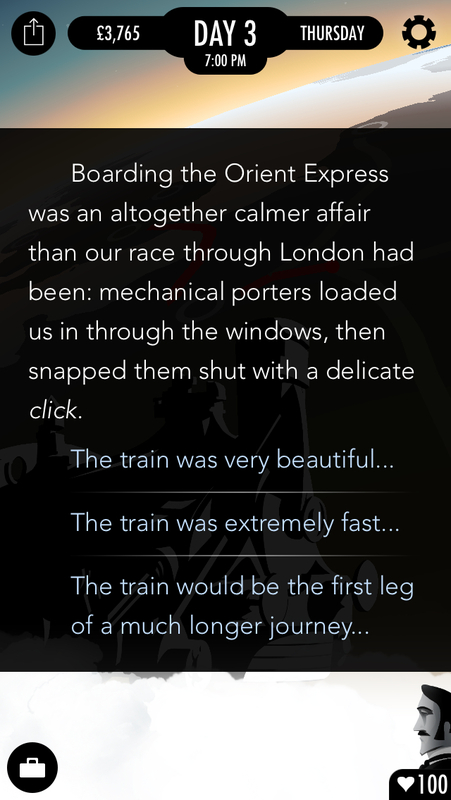 As soon as you make a choice, the text rearranges itself and continues the story. Some choices are influenced by random factors, others by which items you’re carrying, and still more by who you’ve talked to before and what you’ve done. If you were impressed by the sheer possibilities in Sorcery! 2 ($4.99), you’re going to be blown away here. You could play this game to completion a dozen times and not come up with even close to the same series of events. Perhaps most importantly, these events are all interesting to read about and pursue further. The quality of the writing is great, handling a huge cast of characters who tend to drift in and out of the story at a moment’s notice. The dynamic between Fogg and Passepartout is particularly well-done, with Fogg feeling like a heavy stone that his poor old valet has to drag across the world. He’s constantly getting himself and Passepartout into trouble but seems largely disinterested in solving those issues himself. It works, though, because the writing properly conveys where Fogg’s head is at. He’s intensely focused on his goal, but just as his pride got him into this mess to begin with, it also brings you into new problems along the way. That he’s the cause of these delays is of no consequence or mind to him. He expects you to make it right and get things back on track, as a good valet apparently should. He’s free enough with his praise that you never quite come around to hating the guy, although you might find yourself annoyed with him during certain events. The more typical gameplay elements end up being the least interesting thing about 80 Days. Naturally, you have a time limit to work with, which means even if you manage to make it in time, you can still try to make it even faster on a replay. More critically, you have a soft money limit that you have to deal with as well. Fogg brings along a good sum of cash to get your journey started with, but it’s nowhere near enough to see you through to the end. There are plenty of ways to get more money, with the most efficient means being buying local goods at the market and selling them somewhere else for a big profit. Of course, such favorable market conditions rarely come in a straight line, so you’ll have to sacrifice some time and throw yourself off-course a little to truly take advantage of that method. You can also do odd jobs or occasionally gamble, which will earn you a little money, but not nearly enough. Finally, you can draw on what amounts to a nearly unlimited source of cash by stopping by the bank, but since PayPal hasn’t been invented yet, these money transfers can take a very long time, depending on how much you need. Time is constantly your enemy, and you’ll be surprised at how many ways you’ll find to waste it. Even at the most fundamental level, the various means of transportation you’ll be using almost always require you to wait, since they have their own schedules that don’t necessarily line up with your desires. You’ll feel like you’re making good time and then suddenly a vehicle goes off in an unexpected direction, your money is stolen, you’re thrown in prison, or some other crazy happening occurs to throw you behind schedule. With that said, you don’t face a game over if you’re not back in London on the 80th day. You will continue your journey until you get back home, no matter how many days it takes. So, if you don’t particularly care about Phileas’s foolish wager, feel free to explore and see as much as you can. Any routes you uncover will stay that way on your next trip around the world, so it all helps you achieve your goal. As I said, though, the gamey bits are 80 Days at its least interesting. I found myself traveling to new places and following new routes not out of a desire to cut down on my overall time or to make a bigger profit, but rather to see what adventures would unfold along the way. In a way, it kind of beautifully captures what the original story was all about. You can make it all about the goal, ignoring everything non-essential along the way, but the true riches of the journey are found in the people you meet, the places you see, and the events you take part in. Phileas Fogg came to that realization somewhat late in the novel. I wonder how long it will take the average player to find the same truth? In terms of presentation, 80 Days opts for a stylish and simple approach that nevertheless does an excellent job of conveying the fast pace of the journey. There are very few truly animated objects, but the way the visual presentation keeps pieces moving here and there helps it feel more alive than the usual gamebook does. The audio design is wonderful, as well. Ambient sound effects are used perfectly in conjunction with the simple images to help bring the world to life, and music comes in at just the right points to accent things. The game is wise enough to leave a good bit to your imagination, assisting it rather than trying to replace it with its own ideas of the wonders of the world. Considering it’s in a genre that is sometimes content to merely emulate the printed page in silence, 80 Days makes a very respectable showing with its method of storytelling. I’m less impressed by the UI, which is occasionally unintuitive. Inventory management is awkward, and at least initially, you’ll have to play around with touching various things on the screen to get a full handle on what everything does. It’s also sometimes too easy to inadvertedly make a choice when you just wanted to scroll the text box. At its core, this is still something of a gamebook, however impressive a specimen it might be. If you’re totally turned off by the idea of a game that consists largely of reading and making choices, 80 Days isn’t going to change your mind. If you don’t have anything against the concept, you’re probably going to enjoy this game quite a bit, though. I like how it captures the feeling of a Verne story without directly copying it, I think it’s wonderful the way it addresses the usual problem of gamebooks lacking replay value, and I absolutely love the sheer enormity of the world and the huge amount of possibilities that lay within. The twisty, cleverly-written, and ever-changing story more than trumps the minor letdowns in the user interface and gameplay elements. Verne fans in particular are going to have a fantastic time with this game, but I think almost anyone is going to find plenty to like in 80 Days.